Jasmin has enjoyed a diverse career as an actress, host and voice and movement teacher specializing in accent reduction. She has also worked professionally as an actor for the past 15 years on television, film and theater in Australia, England, Germany and the United States. 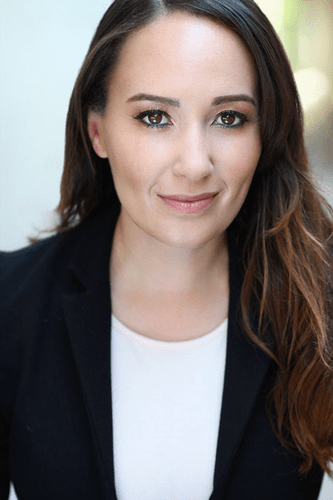 Jasmin is a graduate from The National Institute of Dramatic Art (NIDA-Australia),has a Bachelor of Dramatic Art in Acting, and has two Master’s Degrees from Charles Sturt University Australia in Education (English and Drama) and TESOL-Teaching English to Students of Another Language. Ms. De Main also has a Single Subject Teaching Credential from the California Commission on Teacher Credentialing, and a NSW Teaching license from the Australian Commission of Teaching. Jasmin has worked as a theater arts and drama teacher in the school system (independent, public and private sector), and private acting conservatories (adults and children). She currently teaches in LA with LAUSD in the STAR Education Theater Department, and is co-director for youth musicals with youth in Hermosa Beach at Family Theater. Jasmin teaches at the Los Angeles Performing Arts Conservatory (LAPAC) in Santa Monica as a Voice, Movement, ESL Theater, and Acting Teacher to adult actors and is a private coach to LAPAC’s foreign clients needing accent reduction, and audition preparation. She also works for OCSA_Orange County School of the Performing Arts in the Acting Faculty where she teaches History of Theater to senior students. Jasmin works privately with professional clients from the entertainment and business industries. In addition, Jasmin works at Garry Spatz Acting Conservatory specializing in classes coaching young professional working actors. Ms. De Main’s foreign teaching experiences include teaching in London as an inner school city teacher, in Frankfurt at the ISF-International School in the English, Drama and ESL Department, and as an acting coach for Bright Stars Talent Acting Agency in Sydney. Additionally Jasmin worked as a Theater and acting teacher throughout Australia for her alumni school NIDA Open Program (on tour). This involved teaching adults and children acting classes in regional and isolated areas. Highlights included working with indigenous Aboriginal and Pacific Islander students from underprivileged socio economic backgrounds.